An application to designate the Hyde Park and Paddington Neighbourhood Forum was made to Westminster City Council on 22 December 2016. Following the application’s validation the City Council is inviting formal responses from businesses and residents. The role of the Hyde Park and Paddington Neighbourhod Forum will be to lead and undertake neighbourhood planning. This will give the community, both businesses and residents, a chance to influence development and change your neighbourhood. 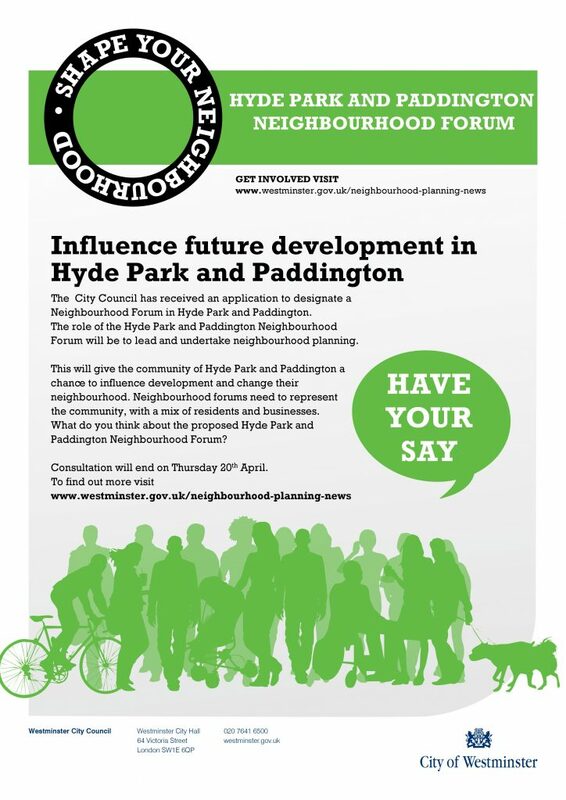 Find out about the proposed Hyde Park and Paddington Neighbourhood Forum here, and join up here. Once you have joined you can also take part in an informal online poll which is being used to start the discussion about local needs and priorities. You can view more information about Neighbourhood Planning in Westminster here. If you have any questions about the proposed Forum or would like to meet to discuss the Forum in more detail please email us. Download the official call for responses here, which you can also use to display in your business or residential premises.